Benefit Cosmetics is about to launch their new Hoola Lite bronzer at Ulta this coming Sunday and I just so happened to find one in-store a few days early! Hoola Lite is a natural, soft matte bronzer that's ideal for fair skin and claims to have a smooth, finely milled texture. I used to use the original Hoola bronzer in the summertime when I was younger and tanned a lot...I loved the natural matte finish and the way it blended seamlessly into my skin. But the past few years I've been really careful to avoid sun exposure, and I stay pretty fair year-round so the original Hoola is way too dark for me. 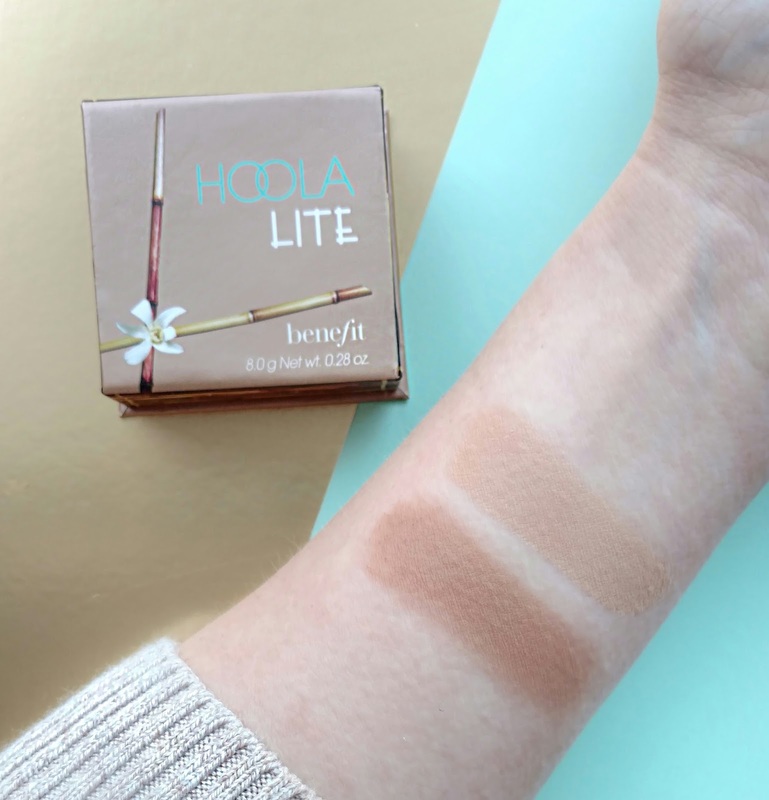 Thankfully, Benefit had us fair-skinned gals in mind when they created Hoola Lite. Let's take a look! 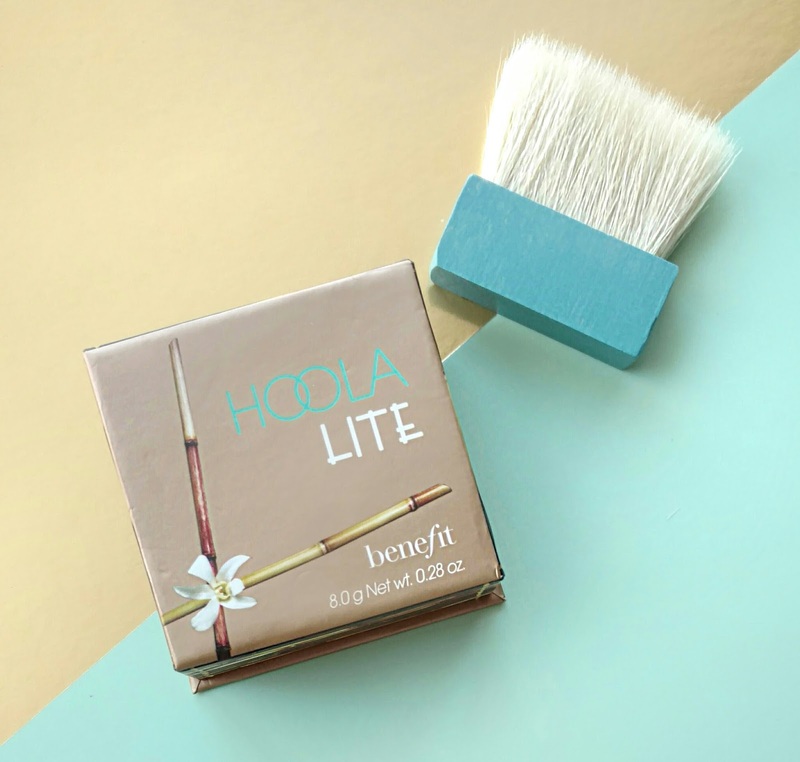 Hoola Lite comes in the same boxed packaging that all of the Benefit face powders do and includes a flat brush that sits inside. The box has a hinged lid that with a mirror inside...I'm not sure if this is something new or if they've been doing it for a while. When I used to use Hoola a few years ago, the entire lid came off and there was no mirror. Swatched on my arm, you can see that it's not really cool or warm but is just a light, neutral brown. That's what I loved about the original Hoola...it wasn't orange or a cool-toned shade that you would use for contouring. This truly is the same exact thing, just lighter. Here it is next to the original Hoola, which looks really dark on my fair skin. I used Hoola Lite on my face today and it gave me the perfect glow...it didn't look like I was wearing bronzer at all, but it warmed up my skin in the most natural way. 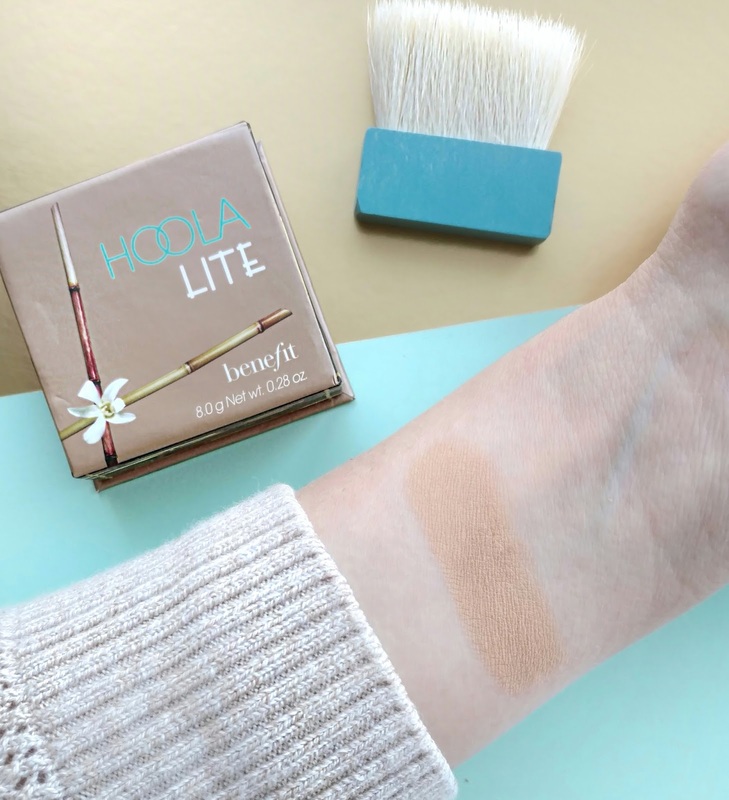 If you have fair to light skin, you're going to love Hoola Lite. It's the perfect bronzer for pale girls! Very subtle! But I like it. I saw your swatches featured on Trendmood which led me to your page. I have a question and I hope that I don't sound like a jerk but on Trendmood there were lots of people that complained because Benefit didn't make a Hoola Dark for deeper skinned people and people of color. I don't mean this in a bad way so I hope people don't take it as such, I really, truly don't understand why they are saying this. I thought bronzer was supposed to be so that pale people can warm up their skin and look more tanned. If you already have a deeper skin tone, you're already blessed with that look so why would you need bronzer? I'm a pale skinned person so maybe I just don't understand but I am looking for someone to educate me on this subject. Thank you! Hello! As someone with a tan complexion, bronzer can warm up the skin. That's the whole point regardless of skintone. Jackie Aina (a YouTuber) has a very deep skintone and she uses bronzer because it livens up the skin once she applies the concealer, foundation, powder, etc. It can be something that is used for lighter complexion to warm the skintone, but for tan to deep skintone it can create an overall cohesiveness. Covergirl has bronzers specifically for darker skintones, so the desire is out there. Brands just don't listen and when they do, they make the bronzers orange (regardless of the customer, no one should be using a orange undertone bronzer). Also Hoola is a unique product as one can use it for bronzer AND contouring if they choose. And I think that's where some of the complaints are coming from. 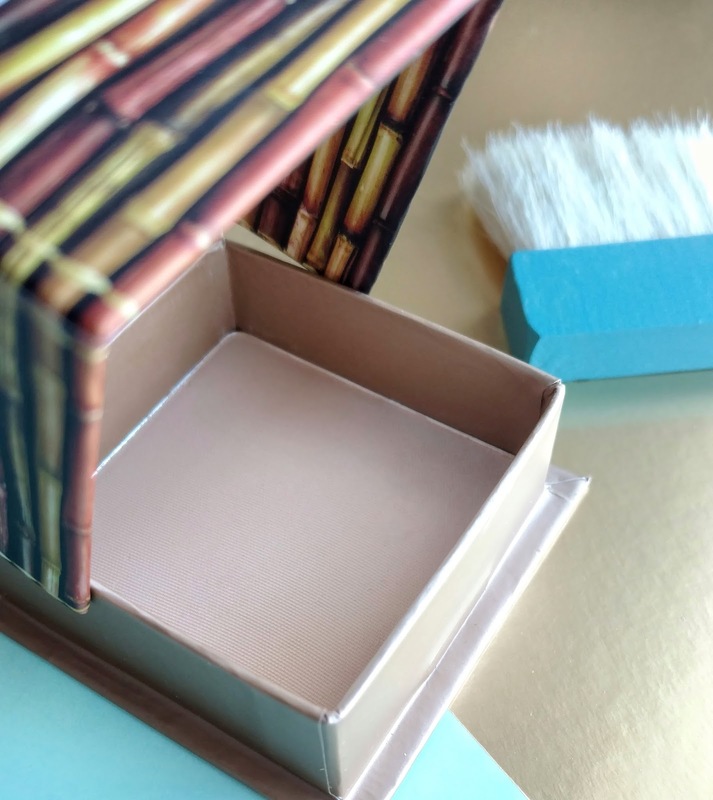 It's easier to have a two in one product since Hoola has a neutral undertone. I wondered the same thing as anonymous. Thank you Misssomayea for the insight! As a fellow pale girl, I didn't realize that those with deeper toned skin needed to use bronzer too. I found it at my Ulta yesterday and redeemed my points for it, it's just perfect!! i saw on another beauty blogger's site that benefit is going to be coming out with a hoola cream to powder contour stick. will you be reviewing that too?